Celebrate with Woody, Buzz, and all the Toy Story characters! 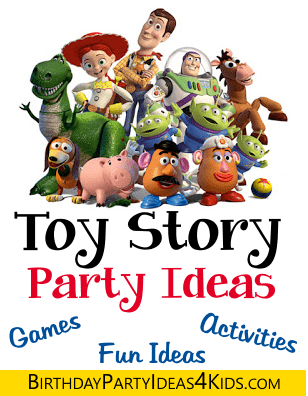 The party games and ideas are centered around the Toy Story theme and you will find lots of great ideas to mix and match to make the perfect party for your child! Guests race to put together their potato heads before the other team. Buy several Mr. and Mrs. Potato heads and set up at least 2 per team. At the start set up the bodies of the potato heads and at the other end of the playing field place a basket with the potato head parts. Teams line up one after the other and the first person in each line runs to the basket, picks out a piece and then runs back to the start and puts their piece on the potato head. Then the next person in line does the same. The team who completes their potato heads first win. For older children and more of a challenge put both teams pieces into one basket. Before the party fill and hide colorful plastic eggs with candies or small Toy Story toys and hide around the party area. Give the guests something to use when they are searching for Rexs' eggs like a small basket or paper bag. If you want to give out bigger prizes then will fit in the eggs number the prizes and then write the number that corresponds with the prize on a piece of paper and place it inside some of the eggs or write the number on the outside of the eggs with a permanent marker. This is a fun relay for children over the age of 3. You will need two large piggy banks, a plastic pool filled with sand or water and over 150 pennies. Fill the pool with sand or water and place the pennies in the sand - mix them up in the sand so they are harder to find. A distance from the pool set up the two piggy banks on sturdy tables. Divide the guests into two teams and have them stand behind the piggy banks. One at a time the teams must go to the pool, find a penny and run back and place it into the piggy bank. Then the next person in line does the same thing. Keep the relay going for a determined amount of time - 5 or 10 minutes - and then count and see which team has the most pennies in their piggy bank. For this fun relay style game kids will divide into teams and one at a time put on Woody's Sherriff clothes, tag their teammate, run and take off the clothes and then tag out and the next person in line starts. Before the party set out two piles of similar clothes that have a western or sheriff theme. Some examples are western shirts, vests, boots, cowboy hats, bandanas, belts, sheriff badge, jeans, etc. Teams line up and the first person runs to the pile of clothes and puts on everything in the pile. They then run back to where their team is and tag the next person in line. After they tag their teammate they run back to where the pile of clothes was and take everything off. Then they run back to their team and this time when they tag the next person in line that person takes a turn and runs to put on the clothes. Continue until the whole team has completed the relay. You will need plastic army men and a tall bottle with a 3 - 4" opening. Ask the guests to try and drop the plastic army men in the opening of the bottle while standing over it. For more fun games see our games page. 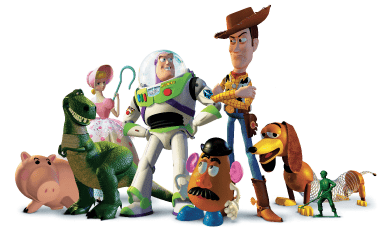 The western , star wars and horse theme pages also have fun games that would fit nicely with the Toy Story 1, 2 or 3 theme. Cut out Sherriff badges from yellow or gold cardstock and let the guests decorate them with paint, glue and glitter or stickers while the guests are arriving to the party. This is a great way to make name tags also. Rent a bounce house in a space theme and let the guests jump and bounce like they are in space. They can even practice "falling with style". To infinity and beyond! Create an Etch-a-Sketch invitation and printing the party information on the Etch-a-Sketch. Send out invitations with all the characters from Toy Story on the front ... make your own invitations by taking a photo of all the Toy Story characters with your child in the middle of them. Print the invitation information on a small piece of paper and roll it up. Place inside the parachute of a plastic army man and then roll the parachute back up and secure with a rubber band. Decorate the Toy Story party area in Red, Green and Blues to match the Toy Story movie theme. Make a long pennant type banner using triangles of scrapbook paper glued to a ribbon or string that has different Toy Story picture on each pennant - cowboy boot, space ship, star badge, penny, etc. Solid red, blue and/or green tablecloths on the party and guest tables and matching streamers along the walls. Use helium balloons in red, blue and green and tie on the backs of each chair at the party table, or around the party area (give as a favor when the party is over). Hamburger Planets - Just a fancy name for Hamburgers. Bread stick Light Sabers - Bread sticks - serve with dipping sauces. Pizza Planets - Serve pizza with mozzarella cheese slices cut into star shapes. Quesadillas - 2 flour tortillas grilled in a little butter with cheese in the middle. Cut into triangles. Toy Story fabric or bright colored bandanas - place favors on the bandana and draw up ends around the favors and tie together.